Follett's Symphony series of ice and water dispensers use SensorSAFE infrared technology to make dispensing hands free, convenient, and sanitary. Move the container to the actuation zone marked by the graphic. The infrared sensor detects the container and dispensing begins automatically without any need for buttons or levers. Pull the container down to stop dispensing. The water dispenser works the same. Up into the actuation zone to begin dispensing and down to stop. For more information, please contact Follett or your local sales representative. Check out this quick video to see how Follet's SensorSAFE ice and water dispensers encourage hands-free convenience and sanitation! For more than 30 years, Follett has supported health care facilities with Symphony ice and water dispensers. 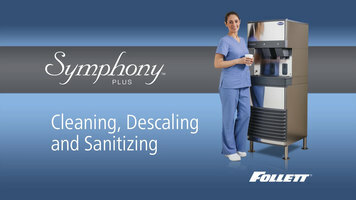 Designed specifically for patient care, Follett’s ongoing efforts to meet the demanding needs of the health care market has inspired continuous product improvement and the development of the Symphony Plus series, with a focus on sanitation, service ability, sustainability, and overall low life cycle costs. An upgrade to our popular Symphony Series, Follett’s high performance Symphony Plus ice and water dispensers offer the industry’s largest selection of countertop, free standing, and wall mount dispensers, and require the least amount of counter or floor space. The right choice for patient care, Symphony Plus dispensers produce chew-glit ice, soft and, as the name suggests, chewable. Chew-glit ice promotes hydration by keeping drinks cool and refreshing for recovering patients. It also forms well in ice packs, providing excellent surface contact to reduce swelling and sooth pain. For cleaner and more sanitary patient ice, Symphony Plus dispensers are treated with agion, antimicrobial protection, to inhibit growth untreated surfaces that come in contact with the ice and water. Plus, Follet’s sensor safe infrared dispensing eliminates all physical contact between the cup and the dispenser, greatly reducing the chance of cross contamination. 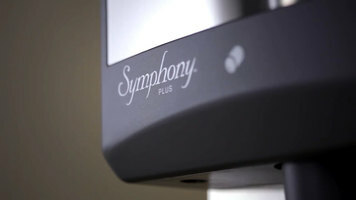 And Symphony Plus’s new automatic self-flushing routine regularly empties and refills the ice machine water system. 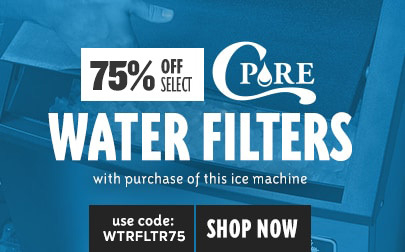 To remove impurities and provide fresh water for making ice. 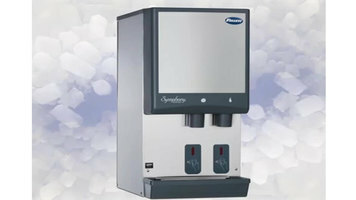 Symphony Plus ice machines are also easy to service and maintain. Each Symphony Plus dispenser has a common high-performance ice machine that produces 425 pounds of patient-preferred chew-glit ice per day. This allows facilities to inventory just one set of parts and maintenance staffs only have to learn about one ice machine. Having a spare replacement ice module on hand ensures zero down time. An ice machine needing service can be easily removed and replaced with a new module in minutes, allowing nurses to continue dispensing ice, while the module needing service can be attended to in the maintenance shop. 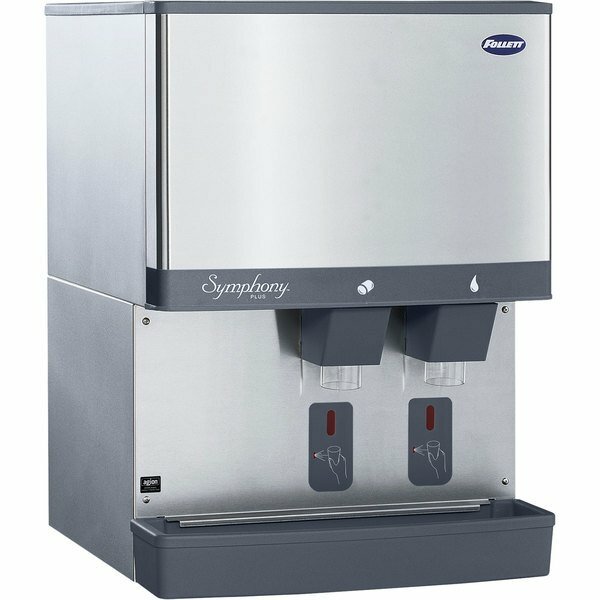 Since ice machines usually wear out before the dispense mechanism, the life of Symphony Plus dispensers can be extended by replacing only the ice machine module. This results in savings of approximately 40% per unit, giving Symphony Plus the lowest life cycle cost of any ice and water dispenser in the industry. Good preventive maintenance of the ice maker and dispenser is still the most effective way to achieve satisfactory performance, long service life, and a steady supply of clean, sanitary, patient ice. One of the most valuable features of the new Symphony Plus series is semiautomatic cleaning and sanitizing. This new 3-step process will reduce cleaning and sanitizing time for the entire ice machine and dispenser to less than one hour, a savings of 50% or more compared to other ice and water dispensers. Symphony Plus also improves service ability by making the equipment easier to understand and analyze. The new user-friendly control board with intuitive LED diagnostic lights aids technicians in troubleshooting and servicing. Follett dispensers provide a sustainable environmental solution. Water consumption is 40% less than that of similar sized cube type ice machines and all dispensers meet Consortium for Energy Efficiency, CEE, Tier 2 specifications. Additionally, Symphony Plus ice only dispensers are also Energy Star qualified. To Follett, sustainability not only means energy and water efficiency, but also a soothing environment for patient recovery. For patient comfort, Symphony Plus’ dispensers now have a quiet night sleep mode, to reduce patient disturbance by reducing the number of ice machine startups while maintaining sufficient ice for patient care. Follett’s commitment to quality performance is carefully managed for every aspect of our products. From design and testing, to service and support. Our state-of-the-art manufacturing in Easton, Pennsylvania is continually updated with the latest equipment and processes. Symphony Plus units ship with the best warranty available, 3 years parts and labor on the entire machine, and 5 year parts on the compressor. Follett has also earned an unparalleled industry reputation for exceptional customer service by providing tool-free factory-direct technical support 365 days a year, in addition to free technical service seminars held nationwide. We’re passionate about our products, we like them, we believe in them, and that passion comes through when we are selling the features and benefits, so I think we’re on a good path here. Follett: innovative solutions, inspired by ice. Bring reliability and functionality to your business with Follett’s Symphony Plus ice and water dispenser series! With unparalleled benefits and features, you can have confidence in this cost-efficient and long-lasting machine. With the introduction of symphony plus, cleaning a Follett ice and water dispenser has never been faster or easier. Complete instructions can be found in the manual, packed with the equipment. You can also access the most up-to-date information online at follettice.com or through the QR code under the dispenser cover. Complete cleaning instructions are on the inside of the front cover. As always, if you have questions, or need assistance, feel free to contact Follett technical support 7 days a week from 8 am to 8 pm or visit our website for the latest product information. My name is Earnie Tough, I am the national technical sales support manager for the health care division. This cleaning procedure should be performed by a trained maintenance technician or by a Follett authorized service provider at least every 6 months, or more often if the environment or water quality dictates more frequent attention. Here is a list of the materials required. Be sure to wear rubber gloves, and safety goggles or a face shield for protection when handling cleaner or sanitizer mixtures. Use only these Follett approved cleaners and sanitizers. 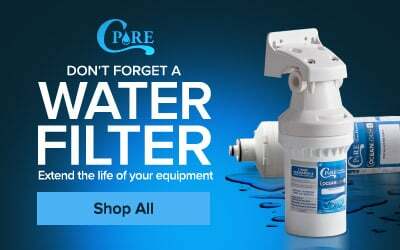 They are available online at follettice.com/partsonline or by calling our parts department at 877-612-5086. We will descale, clean and sanitize a model 25CI425A countertop dispenser. 25, 50, and 110 models all have the same modular removable ice machine. We will then take a look at the differences required to clean a 12CI425A dispenser with an integral ice machine. Cleaning is a four step process. Clean and descale the ice machine. Clean the dispenser, sanitize the ice machine, and sanitize the dispenser. The ice machine is located behind the splash panel. Remove the front cover. Turn off the bin signal switch. All of the ice should be dispensed and discarded. Do not put any of this ice back into the ice storage bin after the procedure is complete. Turn off the dispenser power. Always turn off dispenser power before cleaning or removing parts from the ice storage hop. Remove the dispense chutes, the water dispense tube, and then the splash panel by removing the screws found at each corner. The splash panel can be moved out of the way by turning off the water feed at the right side and disconnecting the water line from the water dispense solenoid. The water valve on the left must remain open for the cleaning and sanitizing of the evaporator. Inspect the drain cup and check the drain pan drain line to ensure they are open and water can flow freely. This prevents potential water overflow during the semi-automatic cleaning. Star the semi-automatic cleaning cycle by pressing the clean switch. The maintenance light will come on and the water system drains. Following the manufacturer’s instructions, mix one seven ounce packet of Follett’s safe clean ice machine cleaner and descaler with one gallon of water that is at least 100 degrees Fahrenheit. Locate the cleaning cup and remove the lid. When the low water light comes on, elevate the cleaning cup above the water reservoir. Slowly add solution to the cup until the solution is going through the overflow tube to the evaporator drain pan. Verify that the cleaner full light turns on. Replace the cup lid. The ice machine will start the cleaning cycle then rinse three times. This process takes approximately 15 minutes. The dispenser can be cleaned while the ice machine completes cleaning and descaling. Immerse the dispense chute, water dispense tube, and the drain pan grill in the cleaning solution. Remove the lid by removing the knurled screws at each corner of the lid. Remove the baffle by taking off the two knurled nuts on the front of the hopper. The dispense wheel is removed with a knurled screw on top of the wheel. Collect and remove any remaining ice. Thoroughness is key to a successful cleaning. The hopper drainline can be cleaned with a three quarter inch bottle brush. Wipe each of the component’s surfaces with the safe clean solution. Spraying the solution is not effective. Use only a soft cloth to avoid damage to surfaces. Do not use abrasive products such as scouring pads. To complete dispenser cleaning, use a damp cloth with fresh water to rinse all surfaces thoroughly. Be careful not to damage the ice dispense motor by allowing excess water to run down the motor shaft hole at the bottom of the hopper. After approximately 15 minutes, the maintenance light will turn off, indicating the ice machine has finished cleaning and descaling. Pour remaining cleaning solution into the drain pan. Sanitizing is necessary to provide high quality, sanitary ice. Sanitizing removes undesirable and potentially harmful microbial growth from the ice machine. Mix the sanitizing solutions per the manufacturer’s instructions. Use 1.6 oz. of IMS-2 sanitizer with one gallon of water that is at least 100 degrees Fahrenheit. The remaining steps to sanitize the ice machine are the same as the steps used to clean the ice machine. Simply repeat the process using the sanitizing solution in place of the cleaning solution. Sanitize the hopper drain line by dipping a clean three quarter inch bottle brush into the sanitizing solution and running it through the drain fitting into the drain line. You can use the 15 minute cycle time to sanitize the dispenser. Use a soft cloth that won’t damage surfaces. Do not use abrasive products such as scouring pads. Dip, ring out, and wipe down each of the dispenser components with the sanitizing solution. Reinstall each of the dispenser components without rinsing. This treatment keeps surfaces sanitary during reassembly. When reinstalling the baffle, first secure the baffle in place loosely. Place a clean, one sixteenth inch spacer between the baffle and the dispense wheel. Tighten the knurled nut securely, then remove the spacer. Recheck the clearance. By now the dispenser should have completed sanitizing. Verify the maintenance light is off. The procedure for sanitizing the ice transport tube can be made easier by sliding the ice machine partially out of the dispenser. If this is the first time the module is being pulled out, you will need to remove this shipping securement screw from the base of the icemaker. You can discard this screw, since it is only needed for shipping. Turn the water shut off valve on the left side of the cabinet off. Before disconnecting the drain lines, verify that the hopper is completely empty to avoid water spillage. To remove the drain cup assembly, start by pulling all drain lines out of the lid. Then loosen without removing the Philips head screw in the bracket. Lift the edge of the evaporator drain pan and slide the entire assembly out. Place the cup assembly into the sanitizing solution. Use a three quarter inch bottle brush to clean the drain pan drain line from the connection at the drain cup and then from the connection at the drain pan. The hopper drain line should also be removed and placed into the sanitizing solution at this time. Disconnect the water supply line from the T of the water supply line. You can now slide the icemaker out to gain access to the evaporator and ice compression nozzle. We can now clean the ice transport tube and nozzle by removing the insulation from the top of the evaporator, and then the ice compression nozzle by loosening the compression nozzle screw two turns then sliding the nozzle off of the evaporator outlet port. Thoroughly saturate one sani-sponge in the sanitizing solution and insert it into the ice compression nozzle. Insert a second dry sani-sponge into the nozzle. Slide the ice compression nozzle back onto the evaporator outlet port and tighten the compression nozzle screw. Check that the ice compression nozzle drain line is still connected to the bottom of the nozzle and the opposite end is connected to the reservoir. Verify that the vent tube is still connected to the top of the nozzle and is secured in the evaporator drain pan bracket. Reinstall the insulation and slide the module back into the dispenser. Pour the remaining sanitizing solution into the drain pan. Reconnect the water line to the T. Reinstall the hopper drain line. Remove the drain cup assembly from the cleaning solution. Support the drain line and insert the outlet port at the bottom of the cup into the drain line. Ensure that the port is seated firmly. Raise the evaporator drain pan and slide the mounting bracket under the Phillips head screw. Tighten the screw to secure the mounting bracket to the base. Insert the remaining drain lines into the holes in the top of the cap, verifying that they are in place and secure. Turn the left water shut off valve to the on position and check for leaks. Turn on the bin signal switch to start the ice machine. The ice machine will begin to make ice and push the sani-sponges into the hopper where you can collect and discard them. They should not be reused. Replace the hopper lid. Reconnect the water line on the right side of the dispenser cabinet to the water dispense solenoid valve and turn on the water, checking for leaks. Reattach the splash panel and the water dispense tube. Reattach the dispense chutes. Turn on dispenser power and replace the front cover. After 10 minutes, dispense all of the ice from the dispenser and discard. Although the cleaning procedure is the same, some of the parts are designed differently in the compact 12 series dispenser. We will show how to disassemble the unit and locate the key components required for cleaning. The cover is removed by pulling out of the bottom and lifting up to disengage. The cleaning cup and water reservoir are located on the right side of the cabinet. Turn off the bin signal switch. Remove the dispense chutes. Disconnect the water line, and then the splash panel with the four screws. The splash panel can be moved to the side. Remove the dispenser lid and the ice storage hopper lid. On the 12 series, do not turn off the power switch during the cleaning procedure. A safety switch turns off the dispense motor when accessing internal hopper components. The ice dispense wheel and baffle are removed by first unscrewing the knurled screw and taking out the locking plate. Next, unscrew the wingnuts and pull off the backing plate. Then remove the stud assembly and rotating agitator, the baffle, and the dispense wheel. When reinstalling the splash panel, be sure that the top of the panel is engaged behind the port bracket, to ensure that any water drippage runs down the front of the panel. It is easier to reinstall the front cover of the dispenser by first installing the cover, then the dispenser lid. Proper preventive maintenance is the best way to assure reliable equipment performance and a consistent supply of fresh, sanitary ice. If you need additional information, or have questions about this cleaning procedure, contact Follett technical support at 877-612-5086. To ensure that you are providing customers with the most sanitary products possible, follow these guidelines on how to properly clean and sanitize your Follett Symphony Plus water and ice dispenser. Bin Storage Capacity 110 lb. What is a "manual fill" ice dispenser? A manual fill dispenser doesn't actually make ice, so it will need to be manually filled with ice from a remote location. A hopper on top of the dispenser holds the ice for dispensing. An ice machine cannot be mounted on top for automatic filling, like a modular dispenser. This is a great option if you already have an operating ice machine and bin elsewhere in your establishment and are looking to add a new dispensing option without the added cost of purchasing another ice machine. Provide patients at your healthcare facility or residents at your retirement community with refreshingly crisp water and the ice to keep it that way with this Follett 110CM-NI-S Symphony Plus ice and water dispenser! This manual-fill machine boasts a 110 lb. storage capacity and is capable of smoothly dispensing Chewblet ice and cube ice up to 1" square, while the unique SensorSAFE infrared dispensing system helps prevent cross contamination and infection by reducing contact. Simply hold the cup under the dispenser and it will automatically dispense ice or water without any contact between your hands or cup, and the machine. Since this dispenser does not produce ice, it's perfect for facilities that already have an ice machine and bin in the kitchen, but want to allow patrons the convenience of dispensing their own ice. Simply fill the top-mounted hopper with up to 110 lb. of ice, enough to last through your busiest services! This 110 lb. ice and water dispenser takes up minimal space on your countertop thanks to its compact footprint, while the dispenser itself is both attractive and built to last! The stainless steel exterior features a subtle accent trim and smooth contours for an aesthetically pleasing appearance that is complemented by a corrosion-resistant plastic drain pan and dispenser lid. Just as important, this ice and water dispenser incorporates Agion silver-based antimicrobial technology that provides protection of key components that come into contact with ice and water. It requires a 115V electrical connection for operation. Front to Back: 28 1/4"